WINNER OF THE 800-CEO-READ BUSINESS BOOK OF THE YEAR 2015 In the vein of Susan Cain's QUIET and Malcolm Gladwell's DAVID AND GOLIATH, HOW TO FLY A HORSE is a smart, empowering book that dispels the myths around genius and creativity. There is a myth about how something new comes to be; that geniuses have dramatic moments of insight where great things and thoughts are born whole. Symphonies are composed complete. Science is accomplished with eureka shrieks. Businesses are built by magic touch. The myth is wrong. Anyone can create. Acclaimed technology pioneer Kevin Ashton takes us behind the scenes of creation to reveal the true process of discovery and how `new' comes to be. 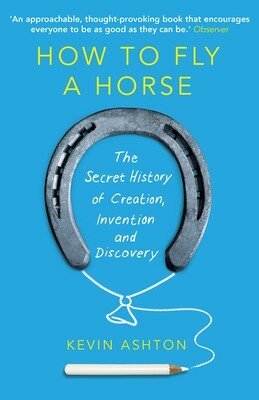 From Archimedes to Apple, from Kandinsky to the Coke can, from the Wright brothers - who set out to `fly a horse' - to Woody Allen, he exposes the seemingly unremarkable individuals, gradual steps, multiple failures and countless ordinary and often uncredited acts that led to our most astounding breakthroughs.